Clemson Girl: Celebrate the Clemson win with a giveaway from All Inspired Boutique! Celebrate the Clemson win with a giveaway from All Inspired Boutique! All Inspired Boutique owner and clemson alum Melissa recently contacted us and asked to offer a special savings coupon code and a giveaway for Clemson Girls in celebration of the big win. All Inspired Boutique would also like to offer all Clemson Girls 20% off of their total All Inspired Boutique purchase by using coupon code GOTIGERS at checkout -- code is valid through 9/30/13. 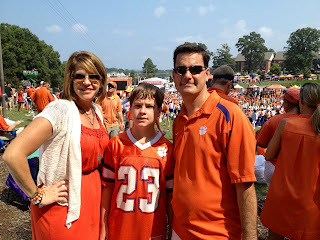 Here is Melissa at the game Saturday with her husband and son. Notice that gorgeous stack of bracelets on her right wrist? 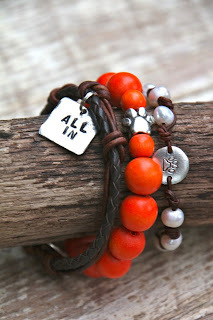 Melissa is wearing the All Inspired Boutique's unique All In bracelet stack. Well, Melissa and All Inspired Boutique has generously offered to give one very lucky Clemson Girl her very own All In bracelet stack! Perfect for gameday - or any day - to show you are All In with the Clemson Tigers. Deadline for all entries is Midnight EST, Thursday, Sept. 5. We will randomly draw a winner on Friday and contact the winner by email. The winner will have 72 hours to reply or we will draw a new winner. Special thanks to All Inspired Boutique for sponsoring today's giveaway! Good luck Clemson Girls and Go Tigers!! What an awesome game on Saturday! We're #4!! My favorite player on the team right now has got to be Tajh Boyd. I think it's because I'm a current student and I've had chances to interact with him personally, and he's such a genuine sweetheart. Not only that, but he has improved so dramatically and he's really making a name for himself. Go Tigers!! We love Sammy Watkins!! Love CJ Spiller! Class act. Go Tigers! Tajh Boyd is a fantastic person and football player. Absolutely am in love with these bracelets. CJ Spiller is the man! Tiger forever. - Lee G.
Love all our players past & present! Love how Tajh is a true leader! Jenny Trotter and I just love our whole team this year! they all make it awesome! Love these bracelets and the tigers!!! Definitely love Tajh Boyd, great player and a stand up guy! After Saturday I have to say Hot Rod is 1 of my favorite players! Cute, cute, cute bracelets too!! Tajh is great and Spiller was amazing. But my memories from football while I was attending Clemson were Justin Miller touchdowns! McDowell was killin it. I was losing my mind while my family slept! Love Them all though. McDowell was killin it! I love them all though. Hi y'all!!! My favorite all time Clemson Tiger would have to be Charlie Whitehurst!!! Nuuuuuk!!! So much so that we named our coonhound after him! CJ Spiller is my fav! We gave him a standing ovation at graduation and I got him for the second year on my Fantasy Football team! My favorite Tiger ever is my dad, Billy Ammons, quarterback from '65-"69, and who played for Frank Howard. Favorite players....Brian Mance, Travis Pugh, Josh Miller, all from my hometown! And current team it would be Tajh, would love to meet him! My favorite player is Nuuuuuuuuuuke!! LOVE HIM! Absolutely LOVE this bracelet! Thank you for the chance to win one! Fight Tigers! Fight Tigers! Fight! Fight! Fight! My favorite player on the team is Martavis Bryant bc he was my friend in high school! CJ Spiller! Such cute bracelets!! Love the bracelet, thanks for the chance to win!!! GO TIGERS, FIGHT FIGHT FIGHT!!! Hmmm - too many to pick just one favorite. Go Tigers! I can't pick just one player. It takes all of them to win! I'm going to say CJ Spiller! Go Tigers! Go Tigers! We love CJ Spiller! He's kind of a player but I love Dabo. He is not only a good coach but an amazing man. Tajh! Such a gentleman and inspiration! We love CJ Spiller. Now on the team Tajh and Sammy. All the Tigers. Love these bracelets. So pretty. Well my favorite player now would have to be SAMMY. He reminds me of C.J. so much and if he keeps his head up and hands clean he will go far. My daughter who is 10 cheers him on every game. we are a ALL IN family. And orange seems to be the only color in our closets. I live in Columbia,SC and finding Clemson things is next to impossible. The bracelet is very pretty and I would like to own one. I would wear it around all my Carolina friends, and wear it proudly. My favorite Clemson player was CJ Spiller. Boy could he run. Thank you, Sandra Valencia. I have two favorites both are family. Drafted by the Houston Oilers in the 10th round (271st overall) of the 1989 NFL Draft. Went on to play with the Atlanta Falcons and Seattle Seahawks. I am biased though...they are both my cousins! :-) GO TIGERS!! Pinion. Kick the heck out of the ball. Go Tigers! Favorite current player is Adam Humphries. I believe he is underutilized. He has great hands. Go Tigers!! !